Carrie's list on ways to go green! Be inspired to go green! The word ‘upcycle’ is to essentially reuse discarded objects to create something of higher quality &/or value. Take an unloved & outdated piece of ugly orange pine furniture, whack on a bit of Chalk Paint™ (every upcyclers best friend!) & some new knobs & it’ll be transformed like the ugly duckling. So why should people start embracing upcycling? The number 1 reason to upcycle is obviously that it saves you money. We live in a throw away generation whereby people are so quick to just chuck away unwanted items; the perfect chance to get your hands on something to give a makeover! Why buy new when you can let your creativity flow and create something completely original for your home? Nobody else will have the same & you can let your imagination run wild. Instead of taking unwanted bits to the dump, recycling them as something else & turning them into something you love is the way to go. The landfill is wrecking havoc with our environment so next time you make a trip to the dump, think ‘can I repurpose this?’. Older pieces of furniture are generally better quality than more modern pieces…hence why they’ve step the test of time but may not be in fashion anymore. Going for old pieces of furniture will mean that you get something better quality for a fraction of the price. When you upcycle something, you get the added benefit of not having the same look as everyone else with their mass produced flatpack furniture. You can customize it to be unique to you as well as fitting perfectly in your home. Think colours, patterns or decoupage. Annie Sloan, the Queen of paint! This wardrobe is painted in Old White Chalk Paint™ by Christen of Blue Egg Brown Nest. This was really popular on Instagram and Facebook and it’s not hard to see why. Wardrobes take up a lot of precious bedroom real estate and if they’re big and brown they can dominate the space in a pretty unpleasant way. There are a myriad of painterly decorative effects you can achieve with Chalk Paint™ - but Annie Sloan says "it’s most powerful when used to turn functional but ugly furniture into something harmonious, which can be enjoyed rather than endured". Have you painted something in your home which was not to your taste, but was a useful piece of furniture, and then fallen in love with it after a coat of Chalk Paint™? These pieces have been painted by Sara, whose work you can find on Instagram @surrey_lane_home. They are in the two new Chalk Paint™ colours, Svenska Blue and Chicago Grey! A dream in green is this chest of drawers, which looks like it came directly from an enchanted forest. To achieve something like this you need to work in a lot of colour to create that nuance and beauty which is so fairytale beautiful. First, it was painted a base of warm Chalk Paint™ tones. Barcelona Orange, English Yellow and Burgundy in a rough ombre (think strips of colour in decreasing depth rather than carefully blended washes at this stage). Then a top coat of green was applied. Amsterdam Green at the base of the piece, over Burgundy and Barcelona Orange, which then fades into Lem Lem over the top of English Yellow at the top. Then wiped back the greens in places using a damp rag to reveal the base colours beneath. Throw pillows and rugs are go-to accessories that make a house a home. Probably the #1 home decor accessory that we rely on to create a cozy feel in our homes is the almighty throw pillow! I simply love how a pillow can instantly make a space feel styled and comfortable. One of the most overlooked, but arguably essential, home accessories is a small rug. 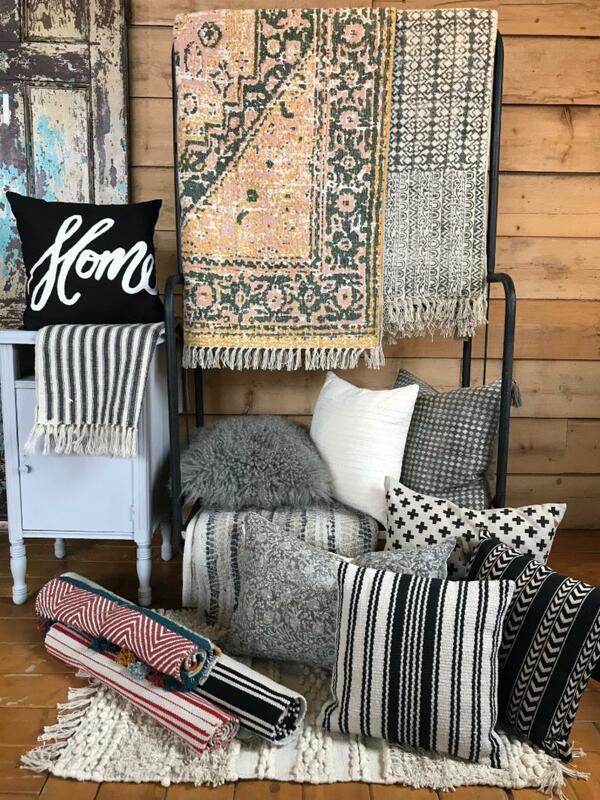 While most of us spend an inordinate amount of time looking for the perfect area rug for our living room or bedroom (trust me, I've been there), We think small rugs and mats are as much a part of creating a well-styled space as any other accessory. We are adding fashion, decor and furniture to our online so you can shop from the comfort of your home in your jammies if you like! It's a slow launch as we learn all the "how to's". Right now you can reserve for in-store pick-up and very soon we will start shipping right to your home. Spring is the season of rebirth. And after a season of winter we all love spring. The problem is that we are usually ready for it before it’s ready for us! Waiting on weather is not always fun, but that’s all the more reason to fake it inside until weather cooperates…which it always does…eventually. Fresh flowers, floral accent pillows and throws, and faux flowers tie together to create a garden-fresh look. Add some bright spring colour. Try using our Chalk Paint™ by Annie Sloan to transform a piece of furniture. Switch out your kitchen towel for a fresh color or pattern. I hope these tips help to invigorate your space for spring! Come in to the shop for all these fresh spring elements! One of Annie's favourite pieces that shows green to its full glory is this botanical beauty! Painted by Annie Sloan's former Painter in Residence Agnieszka Krawczyk, it looks gorgeously rustic and modern at the same time. Agnieszka used Antibes Green, Graphite and Amsterdam Green. Amsterdam is a beautiful mixing colour. Below it's mixed with Pure White. The neoclassical palette included this bright green, sometimes pure and sometimes lightened with white. The colour is also found on rustic country furniture from Ireland and the south of France – a look which is beautifully achieved with Dark Chalk Paint™ Wax. For a warehouse look, try Black Chalk Paint™ Wax. Chalk Paint™ is great on wood, metal and upholstery! Here, Antibes Green is mixed with Old White for some gorgeous mint tints. Antibes Green added to Florence results in a deep emerald. Tints can then be made by adding different amounts of Old White to the custom color. A soft, warm green, inspired by fields of alliums that Annie saw in Ethiopia, grown by women farmers who are supported by Oxfam’s Ethiopian Seed Project. This limited edition colour is great for creating a retro 50's look, and works well as part of a vintage floral style. Firle is one of three exclusive colours Annie has created as a part of the Annie Sloan with Charleston collaboration. Firle is a fresh, zesty and crisp green which echoes the gorgeous distemper of the wall surrounding the mantelpiece in Clive Bell’s study. Think white, green and black with hits of gold — shades that have staying power while making a fresh statement! Did you know that the color green represents hope, youth, life and safety? It sounds like a vibrant way to decorate your home, right? Well, you’re in luck! We are highlighting green in this bathroom refresh. Adding a few accessories in one colour like the green we have used here, can make a statement and pull a space together. The greenery trend is here, bringing inspiration and life to rooms that make walking through your home a beautiful stroll in nature. Try green for yourself today and discover the mood-boosting effects of greenery decor that will leave you primed to start a fresh, bountiful day! Ever Wonder What The Staff Do At Home? They use Chalk Paint™ on everything in their homes! Our staff know this is the best paint ever! They come to work and talk about it with you, use it on store projects and then go home and continue painting! Candice is working on a few bedroom makeover this month. Look at this incredible transformation! First she sanded down the tops and applied Annie Sloan's Chalk Paint™ Wax in Dark. This creates a stained look. Can you believe how different the wood grain looks? That dated tiger look is gone! She painted the bottom portion with Original Chalk Paint™ and finished with clear wax once she distressed them. We are LOVING the new look! These are the new colour, Svenska Blue. Isn't it pretty!